Complex Says: What if Mother 3 was Earthbound 64? The original plan for Earthbound 64 was for it be an epic RPG that used the 64DD to its fullest potential. With the 64DD cancelled, Earthbound 64 saw a short life on the Nintendo 64. It later received a name change and a console change. Development of Mother 3 began shortly after the Japanese release of Earthbound, and it was to be released for the SNES. Developers had big plans for the game on a console with more strength so they took development to the 64DD before moving it to the Nintendo 64. After cancelling the game in 2000, the game was released for the Game Boy Advance in 2006 with the story and elements still intact. The major change between the two aside from the graphical differences is the mood of the game. 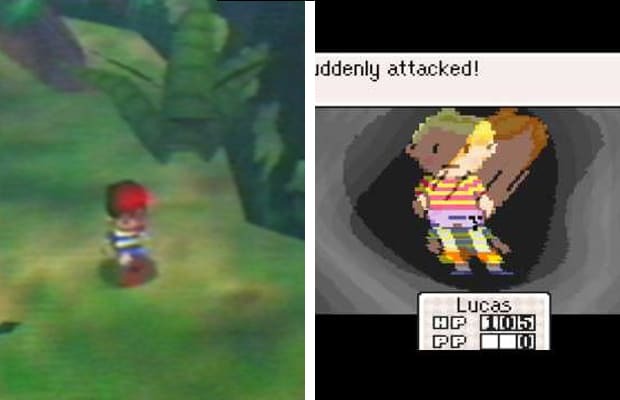 Earthbound 64 was intended to be more moody and darker, while Mother 3 was more colorful and hokey. Also, early builds of the game feature Ness running through a jungle and exploring the ruins of what we presume to be his hometown, Onett. Though Mother 3 found a home on the Game Boy Advance a hacked rom of the game found an unused fight and unused music that is rumored to both be removed, because it was deemed to scary for the game’s audience. The fight’s background used floating images of Lucas and his brother, Claus, throughout the fight. The music is a dark and ominous tune that has a voice saying, “1, 2, 3, 5” slowed down. When the music is sped up, the song is actually, “1, 2, 3, 5!” being said over a cheering crowd, which is a Japanese superstition, that is believed to result in one’s death. Very grim, hence the removal.